NB QuickTime is supported by Apple for the Mac, but Apple no longer provides security updates for QuickTime for Windows, so this software is vulnerable to exploitation by hackers if QuickTime movies are viewed in the Windows environment. For strata site visitors using Windows machines, all the QuickTime movies on the SEPM Strata website have been uploaded to and can be viewed on YouTube SepmStrata. Alternatively Quick Time *.mov files on strata can be uploaded to your Windows machine and viewed with VLC. This is a free and open source cross-platform multimedia player and framework that plays most multimedia files. These two movies model the evolution of the Llucmajor platform. One is annotated to guide you through the events and the other excludes the annotation so you can concentrate on the animation. If you use either of these schemes to view the film you will be able to step through it slowly while examining the products of each sea level position while gaining a better understanding of the principles explained below. The description below explaining the evolution of the Llucmajor platfom paraphrases some of the papers by Pomar and Ward (1994 and 1999) [see pdfs of these papers]. These papers complement the movie that captures the evolving character of the Llucmajor platform. This sequence of carbonate rocks exemplifies how sea level change determined not only the relative hierarchy of the accretional units of this complex but also how the relative positions of the facies belts developed. Up to four bundles (or systems tracts), which are related to specific parts of the sea level cycle, can be defined from characteristic changes in the hierarchical stacking patterns among these accretional units. High stillstand systems tract, offlapping systems tract, and prograding platform. The lowstand systems tract (LST) formed during the initial sea-level rise, after the lowest point of the sea-level cycle. During this time there is reduced lagoonal production and shedding from the reef diminishes too! The resulting LST usually has no significant lagoonal beds and consists mainly of prograding reef core with thin fore-reef-slope and open-shelf lithofacies basin ward. The aggrading systems tract (AST) corresponds to the greatest rises on the sea-level curve, and is volumetrically the most important of the systems tracts, forming this "enhanced" transgressive systems tract (AST). The result is the flooding of a wide lagoon with both shallow water carbonate production and basinward shedding increased. The AST lagoonal lithofacies overlies the LST and consists of landward-onlapping strata. 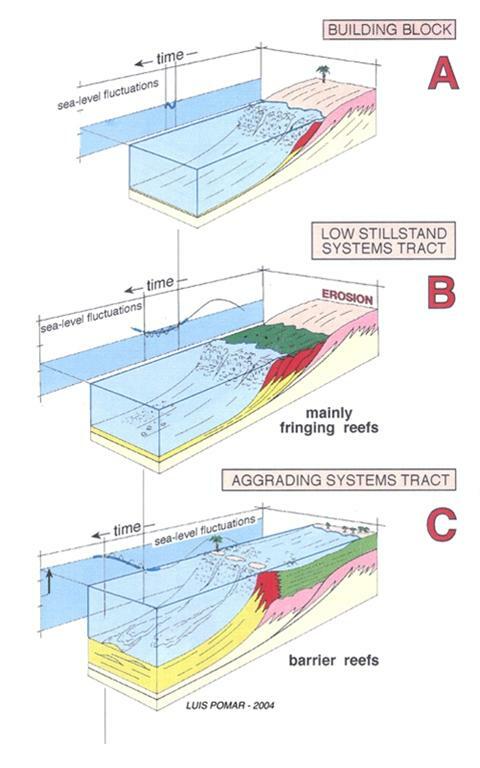 The AST is characterized by thick aggrading well-developed barrier reefs with a matching adjacent aggrading lagoon while seaward forereef slope clinoforms prograde out onto the open shelf (shallow basin) depositional systems. condensed sections are consequently absent and interestingly the reef never backsteps!! In fact neither the reef or the lagoon backstep, even though the lagoon expands landward as result of the landward migration of the shoreline (the landward side of the lagoon). The highstand systems tract (HST) is related to the highest part of the sea-level cycle. It is characterized by lagoonal fill to sea level so ending carbonate production in this setting. In fact commonly lagoonal beds are absent in response to nondeposition or erosion during the subsequent fall of sea level. Products consist of prograding reef core with fore-reef-slope lithofacies thinning and wedging out basinward into the volumetrically condensed open-shelf lithofacies. During major low frequency falling sea level an offlapping systems tract (OST) formed (e.g. : from Movie Step 53 through 78). This carbonate "forced regression" or OST consists of prograding and downstepping reef lithofacies (fringing reefs without significant fore-reef-slope lithofacies), which downlaps onto the distal-slope and open-shelf lithofacies of the previous HST. The corresponding higher frequency sea level change during the OST exhibit high stand, and transgressive facies responses but they are much reduced. Commonly there is little to is no lagoonal lithofacies, and the open-shelf lithofacies is volumetrically condensed however during this time the reef margin has its greatest progradation. The relative volume of these high-frequency depositional sequences was a direct response to carbonate production and accumulation, and the accommodation changes controlled by sea-level fluctuations. 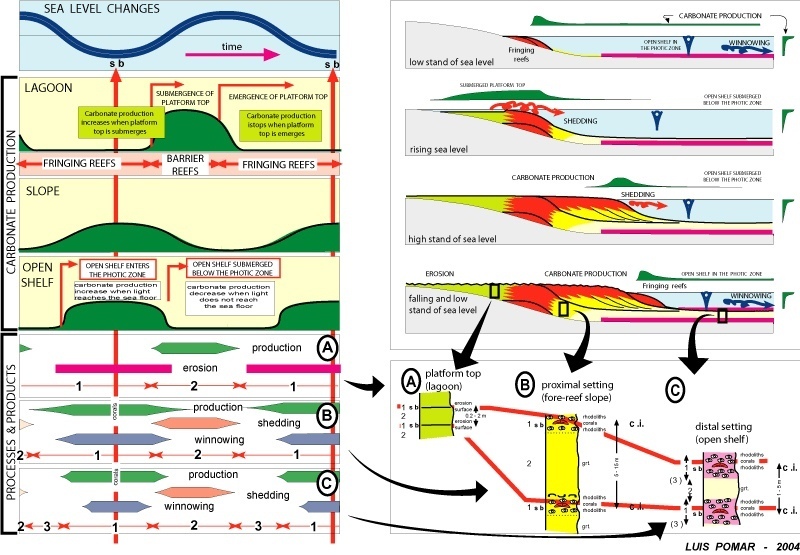 The depositional profile was also important factor in controlling carbonate production. Areal extension of the lagoon was dependent on the morphology and depth of the previous floor and changes of relative sea level. Maximum lagoonal extension took place behind barrier reefs during rises of sea level over gently inclined surfaces while areas with steeper inclined surfaces had narrower lagoons. Fringing reefs with little or no lagoons predominated in all areas during falls of sea level when coral reefs shifted downward and basinward as a result of the decrease in accommodation. Steepness of the fore-reef slope was dependent mainly on the paleobathymetry and depositional profile of the basin floor, rather than on changes in accommodation. Volume of the fore-reef-slope sediments, however, was directly related to the extent of the existing lagoons. Maximum progradation rates occurred during the lowering of sea level across the shallowest gently inclined areas not only because accommodation was less, but also because carbonate production was greater in shallower water. In conclusion, in the absence of significant compaction and subsidence, the progradational geometry, facies and stratal architecture of this platform were controlled by the high-frequency changes both accommodation and carbonate production. carbonate production was not an independent factor with respect to changes in accommodation; production varied according to changes in relative sea level and to the depositional profile of the basin floor. Thus during sea-level lowstands, carbonate production in shallow-basin settings was significant over a large area. The shallow open shelf was subjected to wave action which winnowed finer material and transported it to the deeper open platform so only coarse sediment rich in red algae remained. During the lowest stands of sea level, scattered corals grew on the open platform. The red-algal biostromes of this setting interfingered with the fore-reef slope of the LST on the shallower shelf. The red-algal deposits were not produced when and where the basin floor was too deep to allow sufficient light penetration. When sea level rose, most of the production of the carbonate sediment shifted to the shallower shelf, where extensive lagoons developed behind reefs. 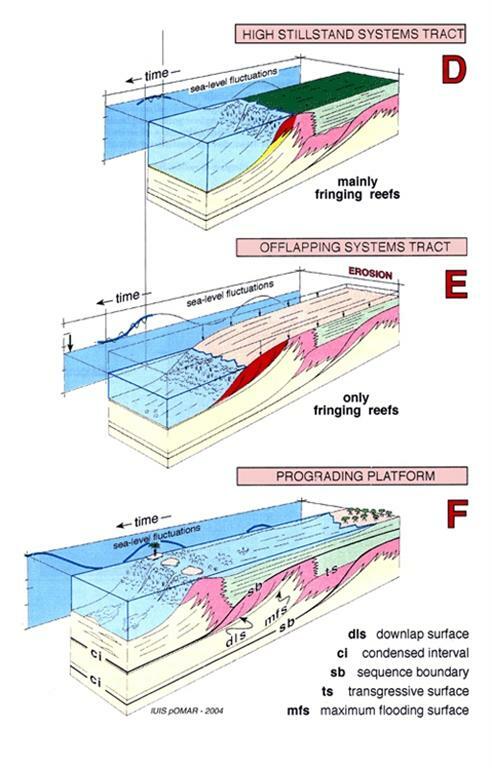 Pomar and Ward (1999) inferred from the stratigraphic architecture that during a rise of sea level, deposition on the open shelf was primarily the result of shedding of fine sediment from the shallow-shelf lagoons, although they were unable to specifically identify lagoonal sediment in the open-platform deposits. This interpretation matches that of other workers who considered that carbonate-sediment shedding is volumetrically important when platform tops are flooded (Driscoll et al., 1991; Glaser and Droxler, 1991; Grammer, 1991; Boschler, 1992; Grammer and Ginsburg, 1992; Schlager, 1992; Schlager et al., 1994). Proximal and distal open-shelf settings differed mainly in the volume of material shed from the shallower shelf. The thicker proximal deposits thinned out basinward, where amalgamated rhodalgal biostromes accumulated over time. Downslope shedding decreased during sea-level highstands and virtually ceased during falls and lowstands. On the shallower shelf, the changes in accommodation were reflected in the up-and-down shifts of the reef lithofacies and truncation of the upper AST/HST reef and lagoon lithofacies. In the lagoons, buildup was related to rising sea level and erosion to falling sea level. In summary, heterogeneity in the lithofacies architecture in this type of prograding platform reflects changes in carbonate production and depended on changes in accommodation and on basin-floor morphology. The linked exercises below have been designed to help you better understand the controls on the evolution of the Llucmajor platform and help you apply the same principles to other shallow water carbonate systems. As indicated earlier high frequency carbonate sequences of this Late Miocene carbonate platform are bounded by erosion surfaces or their correlative conformities down dip. Updip in the shelf lagoon and within the reef crest these erosion surfaces are the products of a sea level fall and subaerial erosion, often complemented by kharstification. Though parasequences are the products of changing base level, rates of sediment accumulation and erosion, cycles formed by carbonates may often be different in character from those formed by clastics. However, as with the clastics parasequence, high frequency carbonate cycles can be used in conjunction with Steno's principles and Walther's Law to provide control on the relative timing of deposition of the studied section. As with clastic parasequences these high frequency carbonate cycles often contain the fundaformformformformformmental units (reservoir rock, seal and source rock) of a hydrocarbon reservoir or an aquifer. Just as with clastics, carbonate high frequency sequences are defined by their boundaries. In the case the Late Miocene carbonates of Mallorca these bounding envelopes are marked by surfaces of erosion that enclose layered wedges of sediment or "sigmoids". The sediment contents of the sigmoids can be considered to have been deposited synchronously but vary in character in response to depositional setting. Using the exercises that follow you will be to identify high frequency cycles in the carbonates of Mallorca and see how the geometry of their carbonate facies change vertically and laterally in response to changes in sea level. In the exercises it will be seen that the high frequency "cycle" or "simple sequence" is the smallest set of genetically related facies deposited during a single base level cycle.The cycle boundaries (in this case erosion surfaces) mark the turnaround from base level fall to base level rise (a period of time during which sea level descends from a highstand position, through a lowstand, and back to a highstand position). cycles can be mapped across multiple facies tracts and include multiple vertical facies successions (VFS) and can therefore be considered chronostratigraphic units (Kerans & Tinker, 1997 and Mitchum & Van Wagoner, 1991). One of the commonest "quoted" manifestations of the carbonate high frequency cycles or sequences is the shoaling upward cycle, with finer deeper water facies at their base and coarser better sorted facies towards their top. In the Late Miocene carbonate platform of Mallorca this is not always the case and instead the commonest signal of the sea level change is an erosion surface. Introduction to high freqency carbonate cycle identification on the basis of the lithologies within outcrops. A measured section is considered and used to identify a vertical set of high frequency cycles within the geologic section at Cap Blanc and interpret the depositional setting of these rocks. 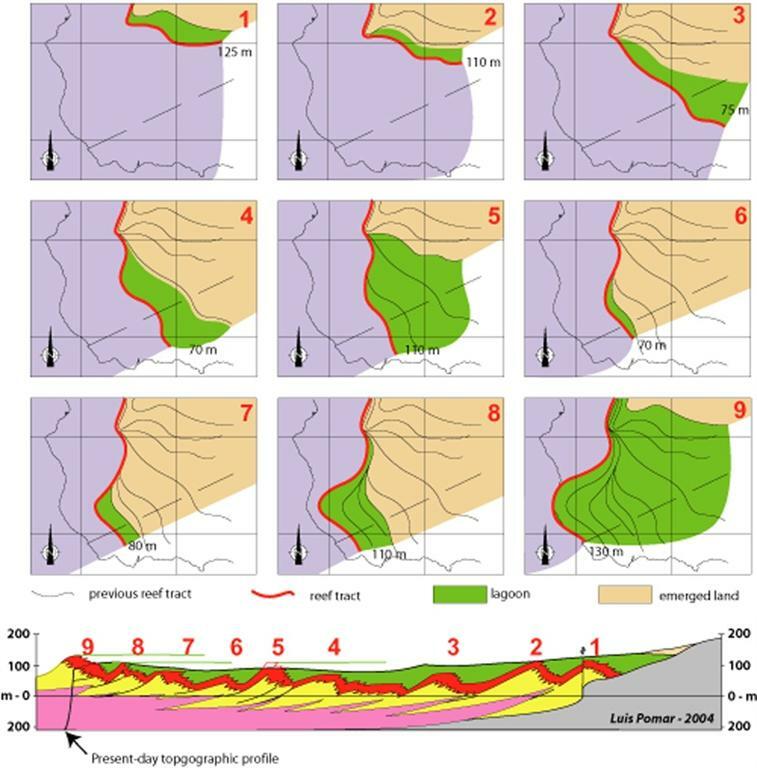 Three measured sections are correlated using a combination of erosional surfaces, (or their correlative conformities), depositional facies and the "sigmoid" (reef core) trajectory to identify the geometry of the major stratigraphic trends of the facies and their stacking patterns to aid in the tieing of one section to the next. This exercise correlates of a number of wells and sections of outcrop in the Llucmajor reef. It combines lithofacies interpretation, major surfaces, and high freqency carbonate cycle stacking to infer and interpret the trajectory of the reef crest of the prograding Llucmajor reef. From this you make a regional sequence stratigraphic interpretation of facies geometries as they filled the Llucmajor shelf.